The bullwhip effect is a phenomenon endemic across almost all markets. It creates a system where information is distorted at every stage in the supply chain, with the result of increased uncertainty and punishing costs. The CyberVein Network could finally bring clarity of information, but with a different solution than has been touted in the relatively new field of blockchain in supply chain logistics—one more able to process vast and ever-growing collections of data. Problems with intermediaries in the supply chain are multi-faceted. By academic estimates, in the United States grocery industry alone, up to $100 billion US Dollars in unproductive inventory each year gets caught between the manufacturer, the manufacturer’s supplier, and the retailer. This is about a third of total sales lost in the pipeline with the majority of costs falling on the manufacturers, but it also creates an uncertain situation for vendors at the endpoint of the chain. Herein lies a major challenge for global logistics: why does this happen and how can it be fixed? 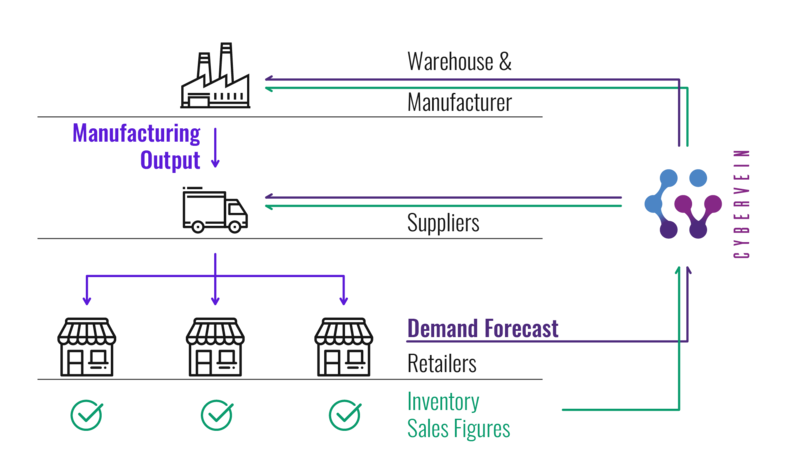 Distortion of information along a supply chain has the power to drastically change the business operations of members at every stage; it has a direct impact on the scheduling of production, inventory control, and delivery plans. The bullwhip effect describes the impact that this has; it denotes the process whereby demand is distorted by the endpoint of the supply chain - buyer, often a retailer - due to the fact that orders to the supplier tend to be larger than actual sales figures. It’s a systemic issue partially caused by the fact that retail outlets and wholesalers tend to forecast higher than the probable real demand because they are reluctant to take the risk of being undersupplied. 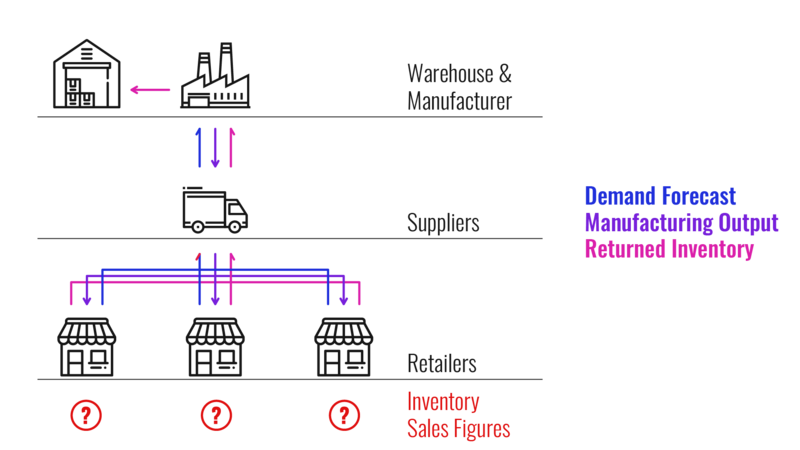 It’s this rational, optimizing behaviour by players in the supply chain which tends to hit the manufacturer hardest. This demand information distortion means that a manufacturer observing its immediate order data becomes exposed to unexpected and substantial costs as a result. Not being prepared for a higher volume of orders can hit them with extra raw material costs from unplanned, last-minute purchases, additional warehouse expenses, as well as unscheduled and thus expensive transportation. They are encouraged instead to observe that the demand coming from retailers is inflated and try to react accordingly. But, if the manufacturer looks like it might not be able to meet demand, then multiple retailers will follow ‘rationing logic’ and try to obtain a larger share of the supply than they might need in order to ensure that they are protected in case of real shortages. The fact that this distortion has a cumulative effect with the more intermediaries there are - and the bulk of the costs going to the manufacturer - makes it a total disaster of inefficiency. Quite simply, clearer information which can be trusted and seen by all individual members of the chain is the only way to solve the problem. Traditionally, retailers have had no obligation or reason to share data on sales and inventory with other members of the supply chain. No processes have been put in place for sharing the figures and it is difficult to imagine them voluntarily developing a function to carry this out. A decentralized database that can only be accessed and added to by relevant, permissioned parties would quickly remove issues of distortion and bring with it much needed transparency. On the CyberVein network, everyone in the supply chain would be able to see accurate figures for sales rather than inflated demand forecasts and as such would be able to adjust accordingly. Numbers based on actual trading activity offers manufacturers and suppliers protection from those gaming the system, while serving the important function of fostering trust. The security benefits for supply chain logistics in a DAG architecture are similar to blockchain by design; records on the ledger are unchangeable and so data the supply chain will be unalterable. Using immutable, trustworthy databases holding transparent information could save hundreds of billions worth of inventory from being trapped in global supply chains. Such a straightforward process also gives retail outlets the tools to easily share their sales data and inventory status - they stand to gain as well, the net benefit from better supply chain management is good for all participants - and help create a system without the level of inefficiency seen today. By allowing all members of the supply chain to see accurate data on forecasts and sales, the system becomes essentially self-optimizing. No longer would manufacturers have to second-guess the order data received from retailers; clarity of data makes everything much more straightforward. The bullwhip effect describes a systemic issue where parties take rational steps to protect themselves from exposure to risk. But, with data being stored on the CyberVein network, the risk could be almost entirely eliminated. If the future is a technology along the lines of blockchain, in supply chain logistics this should be welcomed as an innovation that suppliers, manufacturers, and retailers are all able to get behind. Would you like to learn more about how CyberVein plans to use a DAG architecture to solve the challenge of securely storing massive datasets for rapid analysis? If so, make sure to check out our blog, subscribe to the CyberVein newsletter, join the discussion on Telegram, and also follow us on Facebook and Twitter!